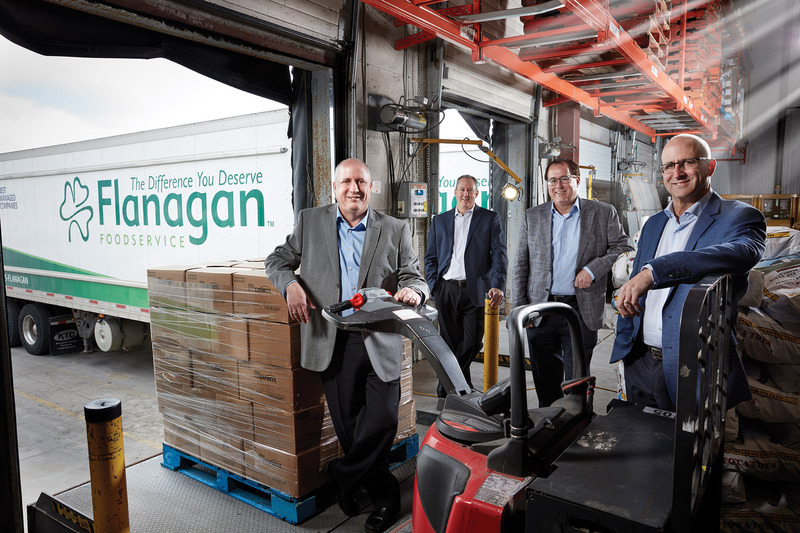 In 2013, three of the four brothers who equally owned Flanagan Foodservice, Canada’s largest independent food distributor, left the business. After their ownership transition, they all remain close. How did they do it? What began as a more or less regular gathering of the four Flanagan brothers for high-level discussions about ownership of their business took a new turn in the fall of 2012. Two of the siblings, Murray and Rick, said they wanted to look into selling their shares in Flanagan Foodservice. Their brothers weren’t surprised. They knew Murray and Rick had thought about leaving the business and had chatted about what else they might do. The company, based in Kitchener, Ontario, is the largest Canadian-owned independent foodservice distributor and employs nearly 600 people. In 2017, it generated revenues of C$513 million. “It seemed like a very simple question, but it was anything but simple,” recalls Murray, 49. At the time, each of the four brothers owned equal stakes in the company their father founded in 1977. Eldest brother Dan, the president and CEO, had his own view of the future. After Murray and Rick made their announcement, “I reiterated that I was not personally interested in any kind of exit and wanted to see the family business continue,” says Dan, 55. Within a week, Jeff told his siblings he wasn’t yet sure whether he wanted to leave but was interested in investigating options. Less than six months later, the Flanagans had a transition and continuity plan. Today, Dan owns the majority of the voting shares in the operating company. Rick, Jeff and Murray equally own most of the remaining voting shares and no longer work in the business. The four brothers have equal ownership of the family’s real estate holdings and some other interests. Most important of all, they and their families have maintained their close relationships. “We started the process in October of 2012, announced the plan to our company right before Good Friday of 2013 and closed the transactions in July of that year,” Dan says. All too often, when a family business restructures ownership, the outcome isn’t seen as a win-win. In a Family Business Magazine online survey of 431 family business stakeholders in 2011, 33.6% reported that over the history of their company, one or more family branches had sold or relinquished ownership. Of those, 44.9% said the exit caused a rift in the family. “We were very fortunate in that we were able to go through the transition the way that we did,” Jeff says. The brothers were able to create an environment where they could safely share their thoughts. 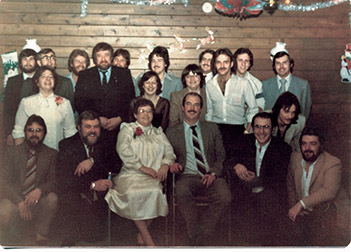 Murray and Dan were active in a national organization then known as the Canadian Association of Family Enterprise (CAFÉ) and now called the Family Enterprise Xchange. Through attending its educational programs, as well as FamilyBusiness Magazine’s Transitions conferences, they learned the importance of differentiating ownership, management and family issues. All four brothers had spent their entire careers in the family business. Their father, Joe Flanagan, had semi-retired and turned the reins over to Dan in 1997. On June 1, 2000, Joe passed away at age 57, just one month after being diagnosed with terminal cancer. Rick’s wife, a teacher, was thinking ahead toward retirement. “Travel was certainly something that was in her plans, and so I wanted to be able to support that,” Rick says. Selling Flanagan Foodservice came up in the brothers’ discussions, but this alternative wasn’t pursued because Dan wanted to continue running the company as a family-owned business. In demonstrating respect for each other’s viewpoints, the Flanagan brothers were following in their father’s footsteps. After 21 years working for HiWay Market, a family-owned store in Kitchener, Joe Flanagan struck out on his own in 1977 at age 34. At first, he called his business Bob’s Surplus Foods because he expected his brother-in-law, Bob Reidel, to become his partner. The partnership never came to fruition, and Joe soon changed the name to Flanagan Sales & Distribution. In late 1979, the business was incorporated as J. & D. Flanagan Sales and Distribution Ltd. “J. & D.” stood for Joe and his wife, Dolores (Dee), who served as secretary-treasurer. Joe and Dee’s four boys — ages 9 to 15 when the business was launched — helped launch the company, which began as a local discount grocery. The boys did what was needed after school and on weekends: stocking shelves, running the register, working in the warehouse, painting, cleaning the offices, making deliveries. The family’s “all hands on deck” mentality would serve the company well in the years to follow. Joe soon shifted the business from retail to wholesale to capitalize on what he saw as better growth opportunities. The company began as a bakery supplier — using a station wagon to make deliveries — and then branched out to serve restaurants, universities, hospitals and other institutions. In 1983, it started hosting its own trade show rather than joining a multi-exhibitor show. Sales have increased every year throughout the company’s history. 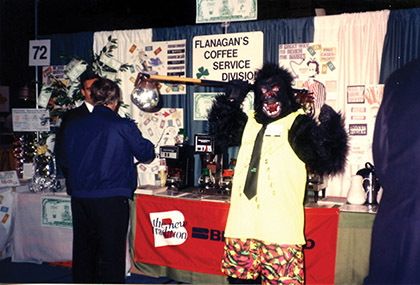 Although most of the growth has been organic, acquisitions have also helped Flanagan expand geographically, increase services and product offerings, and enlarge its customer base. In 1995, the business was renamed Flanagan Foodservice. What made Joe’s venture so successful? One factor was his commitment to customer service: “doing things that our competitors were unwilling to do,” as Murray puts it. Joe was “a forward-thinker,” Dan says. 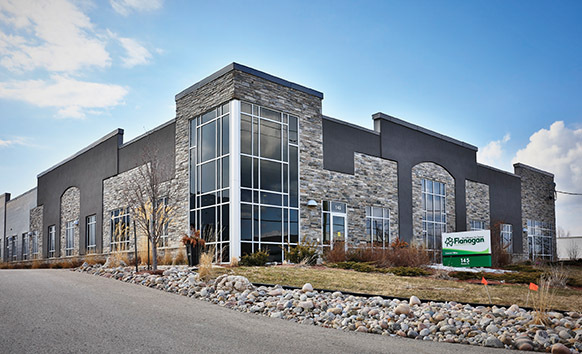 “For example, he purchased a property next door to the main Kitchener warehouse in 1995, even though it wasn’t ultimately needed for expansion until 2010.” The company began investing in technology in the 1980s. Joe ran Flanagan as a democracy. “Decisions were made based on consensus, not based on his own desires,” Dan says. Murray describes Joe as humble, open to suggestions, fair and levelheaded. “I don’t think I ever saw my dad get heated in any kind of situation,” Murray says. Consciously or unconsciously, Joe’s sons absorbed these values. As kids, all four Flanagan brothers had held part-time jobs outside the family business: Murray and Rick at grocery stores, Jeff as a dishwasher at a pancake house and Dan at HiWay Market, where Joe had worked before setting out on his own. None of the brothers intended to make the family business his career. “We didn’t really see the glamour in being a food distributor,” Rick explains. Their lives would take a different turn. Dan studied accounting through a correspondence course offered through the Certified General Accountants Association of Canada. The program required work experience in the field. “My dad said, ‘Well, we happen to need somebody to do some financial reporting and analysis,’” Dan recalls. The offer was hard to refuse. Joe said Dan could work off a loan for a 1980 Chevy Malibu station wagon whose lease to a sales rep was ending. Dan’s 1972 Ford Maverick happened to be in poor condition. Dan joined the company full-time in 1982, working the front desk in addition to his accounting duties. Later, he moved through different roles, including credit manager and office manager. As part of a management reorganization in December 1987, Dan was promoted to vice president of finance. In 1995, he became executive vice president, overseeing finance and sales. He was named president and CEO in 1998 and assumed the role of chairman upon Joe’s death in 2000. Rick’s earliest recollection of working in the family business is painting the warehouse bathroom at age 14. He began making deliveries after school once he got his driver’s license. The summer after he finished high school, Rick filled in for vacationing sales reps. “That was only supposed to last for the first summer after high school, but then one of the sales reps quit, and my father offered me that job,” Rick says. After a year in sales, Rick started driving a delivery truck. “I always liked the transportation side of things,” he says. Three years later, he became warehouse and traffic manager of the company’s Kitchener location. In 1989, he was promoted to vice president of operations. In 1995, he was named executive vice president, overseeing purchasing and operations. Eventually, his duties expanded to include sales oversight. Jeff, who had started out cleaning the offices and washing trucks, joined the business after high school. He worked in the warehouse, on both the day shift and the night shift, and drove a truck for four years. He became the company’s first inventory control manager, a position he held until 1995, when he became division manager of Flanagan’s Coffee Service. When the office portion of the coffee service was sold off in 2007, Jeff was named manager of business analysis and continued to oversee the foodservice portion of the coffee division. Murray studied business at Conestoga College in Kitchener. In 1988, as he was about to graduate, a produce manager position opened at Flanagan’s distribution center in Owen Sound, Ontario, about two hours north of Kitchener. Murray had gained produce experience at his grocery-store job, so the Owen Sound post “was a nice fit for me,” he explains. “I finished college on a Friday, and I moved to Owen Sound over the weekend, and started my new job on the Monday morning,” Murray recalls. After a year, Murray moved back to Kitchener, where produce had been introduced, taking on the role of produce buyer for both Kitchener and Owen Sound. He later assumed buying responsibilities for more products and subsequently became office manager and then administration manager. In 1995, Murray returned to Owen Sound to run the facility there, first as division manager and then division vice president. Five years later, he was back in Kitchener as vice president of operations. In 2003, he was named senior vice president overseeing operations and finance. A year after the company’s 2004 acquisition of Burlington, Ontario-based Roseland Produce, Murray became Roseland’s president. “We were able to do many different things within the business, so we could see the bigger picture,” Jeff reflects. In 1997, Joe decided to semi-retire from the business and transfer ownership to his sons. Joe and Dee exchanged their common shares for fixed-value shares; their four sons evenly split the common shares. Though young, the brothers already were seasoned company veterans. Joe met with his family individually and as a group throughout 1997. After one final meeting in the fall of that year, Joe announced Dan would become president and CEO. “Everyone left united and agreed to support the structure moving forward, which we all did without any real issues,” Dan says. “I thought Dan was best suited to fill that role,” Murray says. “He had the most experience in the business and had one of the more senior roles at that point.” Dan took the helm on Feb. 22, 1998. In his characteristically proactive way, Joe completed his ownership and leadership transition, as well as his estate planning, prior to his untimely passing. His diagnosis came as a shock. “No one — including him — suspected he was even sick until two months before his death,” Dan says. Joe opted to decline chemotherapy. “He decided that prolonging a life with terminal cancer was not worth it, so he refused any treatment to defer the inevitable,” Dan says. Dan’s brothers praise his leadership, saying his style is similar to their father’s. “In the end, [Dan] often had to make the hard decision, one way or the other, but he really took into account what other people felt,” Murray says. “I would say he was probably a little more of a ‘people person’ than I am, but I try to emulate my dad’s leadership style as much as possible,” Dan says. The most significant growth year was 2010, when Flanagan became the approved distributor for all Wendy’s locations in Ontario and Quebec under a multiyear contract that has since been renewed several times. Except for 2010, growth has occurred in “small steps every year,” Rick points out. The transition discussions took place in an atmosphere of trust. “We were brought up with certain values of fairness and respect,” Dan says. “We were also brought up to work through any challenging issues and not let emotion, envy or greed play into it. “Nothing in terms of the strength of our relationship has really changed much since we were young. I would say we’ve always been close, and always had strong ties,” Dan says. According to the brothers, there was never a pivotal parental lecture about the importance of sibling harmony. “Maybe because we always did have a good relationship, it wasn’t necessary to have those conversations,” Murray says. But collective thinking prevailed in the transition talks. “It’s easy to think, ‘Well, this is what’s best for me,’ but when we went through the transition, it was really about, ‘Here’s everybody’s goals; how can we all get there?’” Murray says. “I think [the key is] just the way that the four of us have always been able to get along with each other,” Jeff says. As colleagues, they lunched together frequently. “We just maintained that close family dynamic,” Jeff says. “I always tell people one of the keys to our maintaining that closeness is that our wives all get along incredibly well,” Rick adds. 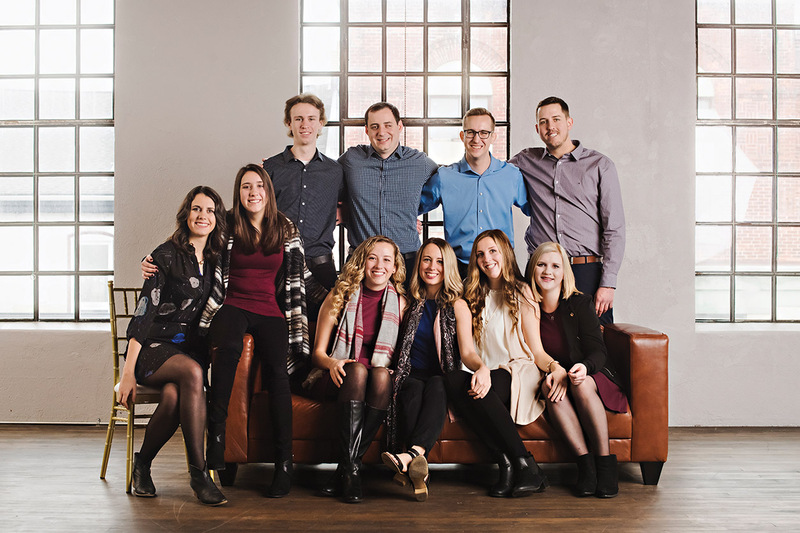 In the fall of 2010, the Flanagans engaged Grant Robinson, a now-retired Canadian family business adviser who was an accountant by trade, to sit in on meetings and help them with strategic and succession planning for ownership. The planning process included individual interviews with the brothers and their spouses. “It involved looking at where they’d come from, the things that had worked and that hadn’t worked — where they [were], and what the future could be,” Robinson says. The brothers worked together to interview and select advisers to help them through the process. “The fees added up pretty quickly when we had all the right people in the room, but we had to get it right from all angles,” Dan says. The Flanagans engaged a major accounting firm to lead the project. Also on the team was a national law firm with a local office in Kitchener. The company’s long-time auditor was included, as well. They invited Robinson to sit in on the negotiations, “to make sure we stayed on track from the family perspective,” Dan says. After several meetings, Robinson told the brothers his presence wasn’t needed. “When it came time to do the buyout transaction, everybody was very confident that it was the right thing to do,” Robinson says. The Flanagans set the tone with their advisers at the outset. “I remember my brother Rick saying, right before the first meeting started, ‘If we can’t get through this and, in the end, maintain our relationship as brothers and go golfing together and spend time at each other’s cottages, then we will stop the process immediately,’” Dan says. The brothers had had a buy-sell agreement prior to these negotiations, but the purpose of that document was to guide them in the event of an ownership dispute, not to set a share price for an amicable transition. “We essentially tore it up and started over again,” Murray says. Most of the real estate already was held in a separate company. Two properties were moved from the operating company into a second property company equally owned by the four brothers. The brothers say there were no sticking points. “It was just very fact-based, like putting the pieces of a puzzle together, and when it was done, it was done,” Murray says. The brothers agreed that Dan, as the sole family executive in the business, should control the majority of the shares. Rick, Jeff and Murray have equal minority stakes in the operating company. “That still gives us a little skin in the game,” Rick says. The trio now serve as board advisers. They sit in on meetings and provide guidance based on their experience in the business. Although they don’t make decisions for the company, they receive the same communications as voting board members do. Dan says he wasn’t worried about recruiting successors for his brothers. He worked with a headhunter and received assistance from Rick, Jeff and Murray and some long-time non-family executives. While Dan says he’s “very pleased with the strong group that we were able to put in place,” he’s had to adjust. Building trust and developing relationships with a new team after working with his brothers for decades takes time and effort. “Yeah, I would definitely say I was probably a little gun-shy, maybe a little bit more conservative, when it came to any type of acquisition,” Rick admits. Jeff, however, sees it differently. “I definitely saw value in acquisitions as well — more so, now that I’ve actually seen Dan doing more of it,” Jeff says. Although no longer employed at Flanagan Foodservice, Rick, Jeff and Murray have lent a hand on certain projects. Murray played a leading role in the production of a book published in 2017 to commemorate Flanagan Foodservice’s 40th anniversary. He also worked with Dan to develop an independent advisory board, which was finalized in September 2017. Rick was involved in overseeing construction of Flanagan’s newest distribution center in Whitby, Ontario. The new facility, serving customers east of Toronto, is the largest expansion in the company’s history. Jeff has participated in training staff members working to extend a customer profitability model he helped develop before he left. All three brothers say they have no desire to return to full-time roles at the company, though they would gladly step in if an urgent situation arose. “I’ve moved from every day doing what I have to do, to every day doing things I want to do,” Murray says. The foursome continue to meet each month to discuss business and other issues. All four families — as well as Dee, the matriarch, age 76 — live near each other. Since 2015, the Flanagans have been holding family retreats, usually over an extended weekend. The retreats have three objectives, Dan says: to provide education, to disseminate information about the business and build family members’ connection to it, and to have fun and strengthen family bonds. “We try to engage NextGens broadly in some of the working committees that come out of the meetings,” Dan says. Committees are cross-branch, to help build relationships among the cousins and give them experience working together. The Flanagans have developed their first two family documents, a family employment policy and a code of conduct. “We’re trying to get together more often than we had in the past,” Dan says. Start with trust. Build constant communication and transparency into the relationship from the very beginning. Don’t be selfish. Work towards a win-win result. Be willing to give and take a little for the greater good. Ensure you have a structured mechanism to allow those who wish to “take some chips off the table” to do so. Everyone must agree on the process for selling shares, which must be put in writing. Take time to do it right. This is a big decision with many implications for the business and the family. Give it your attention, and don’t rush through it. In many cases, when family members reduce or relinquish their shareholdings in the family business, not everyone is satisfied with the outcome. How has the Flanagan family managed to remain close after three of four siblings each sold about 40% of their shares in Flanagan Foodservice? Here are the factors that combined to make the Flanagans’ ownership transition a success. All parties agreed to the share transition. The three exiting brothers wanted to sell shares and leave the business. CEO Dan Flanagan would have preferred to continue working with his siblings but honored their wishes. They, in turn, honored Dan’s wish to keep the business family-owned rather than sell it outright. The business was performing well. The business took on debt to buy shares from the three brothers, but because the company continues to grow, the debt is manageable. The family had a history of open communication. The late Joe Flanagan ran Flanagan Foodservice as a democracy, one of the family values he passed on to his sons. A related family value is respect for others’ viewpoints. Each of the four brothers felt free to express his vision of the future, and they worked as a team to ensure each person’s vision would be realized. Preserving the family relationship was a priority for all parties. At the outset of their negotiations, the brothers set the tone for their advisers, saying they would abandon the deal if they felt family bonds were about to fray. The advisers knew their goal was to work for the benefit of the group rather than any one individual. Family members “knew which hat they were wearing” during discussions. The brothers were able to separate their roles as co-owners of the company, managers of the business and family members. They also understood how role confusion could harm the business or the family. The family members had a history of working well together. They built on their track record of success over decades, and the trust they had built through years of collaboration, to work toward a result that was a win for everyone. The family reached out for advice and proactively sought out information. They networked with other business families and engaged a family business consultant. And they did the homework their consultant recommended.